The official emblem of the XIV OWG, »Vucko«, the Games mascot and the pictograms of sports were accepted as the basic elements of the visual identity of the Games, and were elaborated for wider use in a special handbook entitled »Graphic Standards«. The above mentioned posters and »Sport and Art« collection of graphics contributed a very great deal to the successful visual identity of the Games, and were systematically used in the broad publishing activities of the OCOG, in the printing of tickets, decoration of the city, printing of accreditation documents etc. The designs for winners' medals, commemorative medals and diplomas were also a consistent and qualitative part of the successful visual identity of the Games. In the context an especially successful undertaking was the Yugoslav open competition for designs for the system of visual communications, which was organized in co-operation with the Sarajevo City Assembly and the Association of Applied Artists. 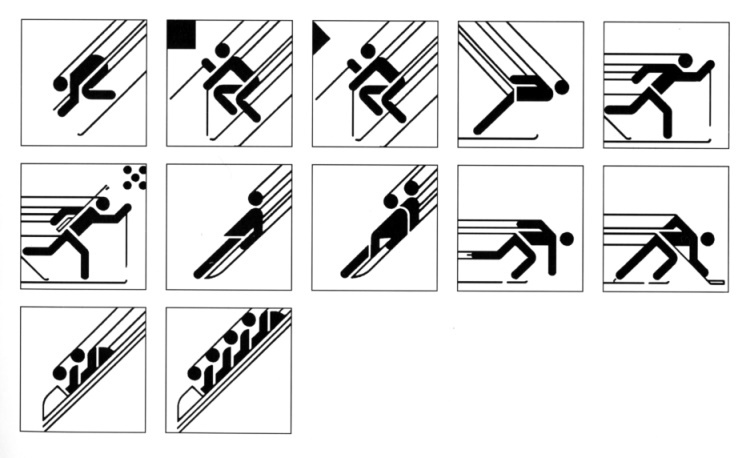 As a result, immediately before the Games, Sarajevo was enriched by a system of visual communications which indicated the whereabouts of all venues and tourist facilities, and covered Olympic decorations, traffic, and pictograms of general content. The Olympic venues were decorated with flags of protocol and decorative character flying from 1300 flagpoles.